Sometimes I get brave enough to do something really messy during Sunday school. This idea for teaching the Elijah and Elisha story when Elijah is taken to heaven came to me and well….I couldn’t resist. I know all the kiddos are dressed in their Sunday best and there is very little time for clean up between Sunday school and Children’s worship, but when I know the kids will love an activity and it is clearly something that will reinforce the lesson….the teacher in me goes for it! That’s what washable paint is for…right?!? Our lesson this week was the story Elijah’s chariot of fire story where he is caught up to heaven in a whirlwind. In the story, a fiery chariot appears from heaven and separates Elijah and Elisha. God takes Elijah and Elisha is left with Elijah’s mantle (cloak) and a double portion of his power as a gift from God to continue His work. 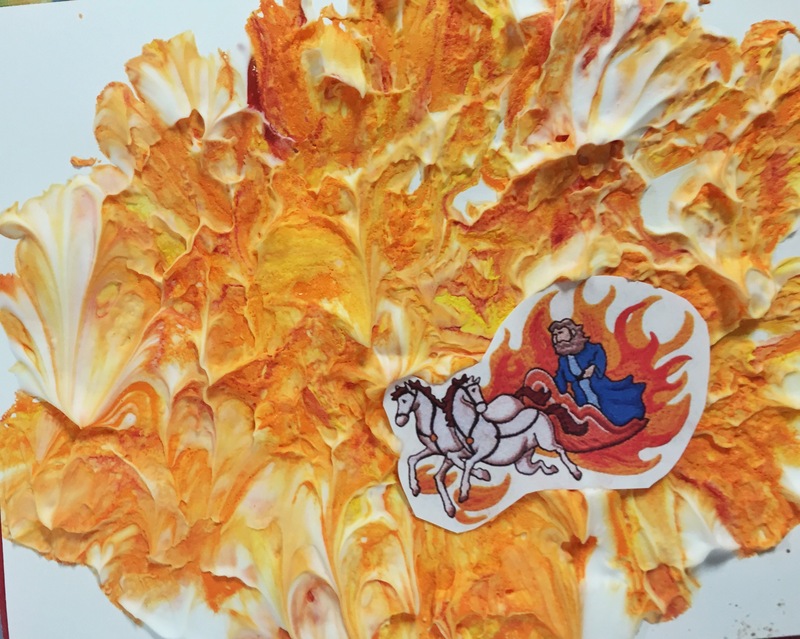 This story is an exciting one for little learners…I mean fire, chariots and a whirlwind all in one story! At the heart of the story is a beautiful transition of God’s blessing and power from Elijah to Elisha so that God’s work could continue. Life wasn’t easy for God’s prophets in the time of Elijah and Elisha. This display of God’s presence surely would have left Elisha with confidence and confirmation of God’s call on his life as he continued to proclaim truth and call God’s people to repentance. When teaching preschoolers, we can emphasize God’s power and his presence as we help them experience the stories of Scripture. Further, we can begin to build in them their identity in Christ and a trust that God has a powerful plan to use them to proclaim truth in their world. We made chariots as the kids came in to class. We find that they trickle in during the first 15 minutes or so (very few are there when are supposed to start!) this time is pretty chill and we try to get them involved in something simple. 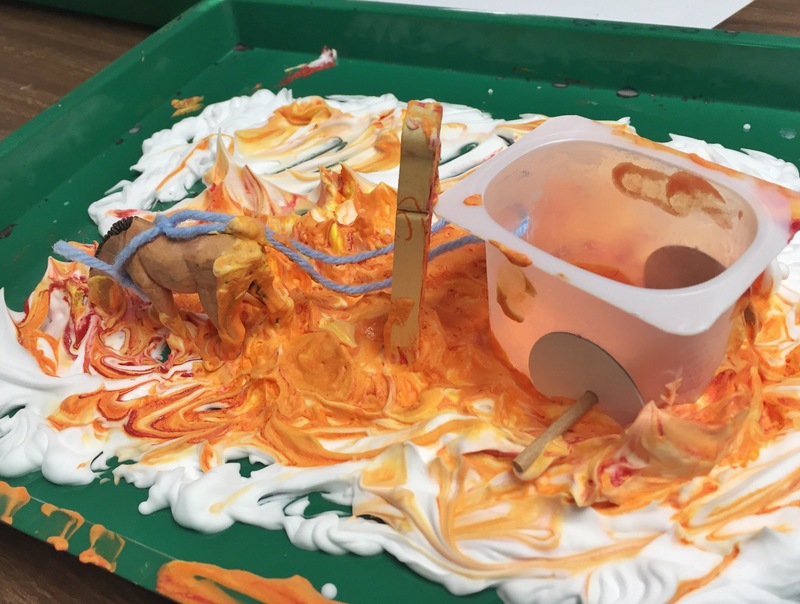 As I made the chariots, I told them that our story would be about Elijah and that there was a chariot in the story. We opted for a simple Elijah Chariot craft using an empty yogurt container, yarn, a scratch stick (for the wheel axle), and some round foam and cardboard pieces for the wheels. I collected some plastic horses that I picked up from the thrift store or in the treasure trove that is our children’s ministry storage area. 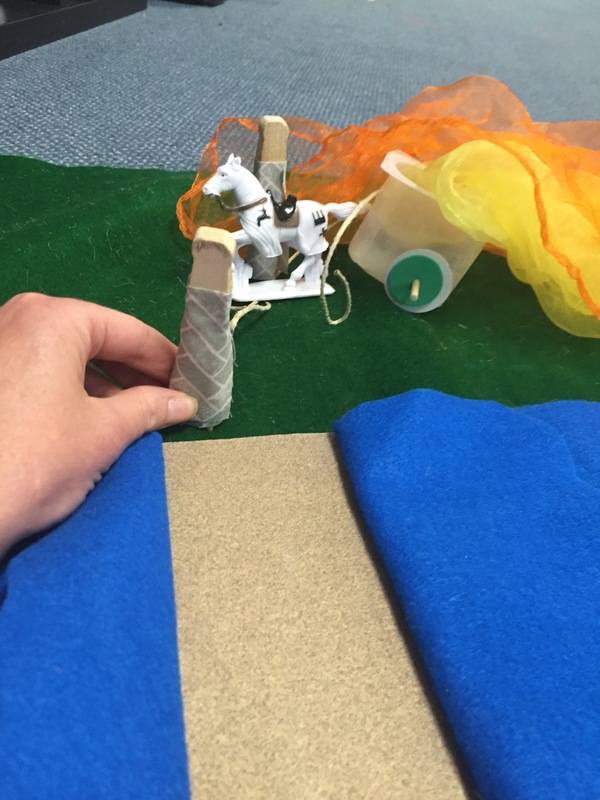 To attach the horse to the chariot, we made a loop out of yarn to connect a horse and made an Elijah out of a clothespin. The chariots are pretty simple to put together but beyond the skill of most of the preschoolers I work with. I put in the axle and attached the wheel and yarn for them while they picked out a horse for their chariot and colored their Elijah clothespin. When I teach Bible lessons for kids, I try to use simple props and learn the story well enough that I can retell it easily. 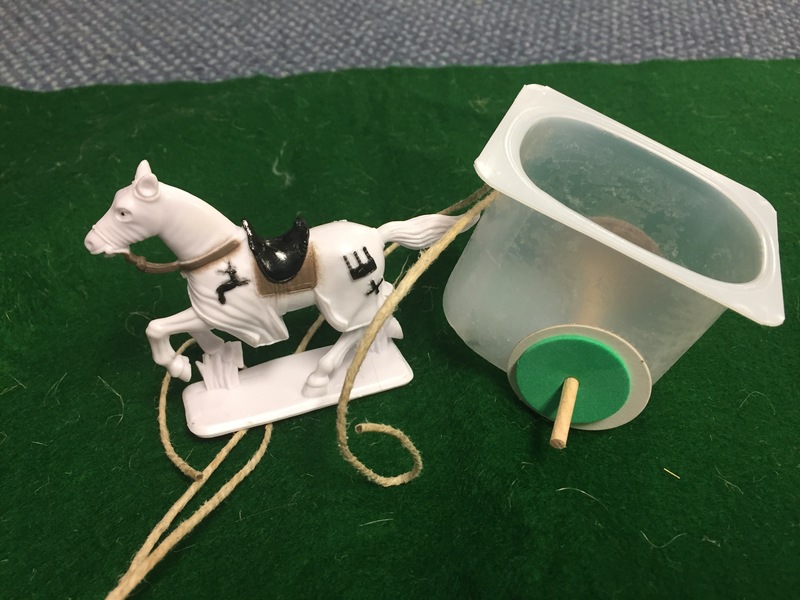 For this Elijah and Elisha lesson, I acted out the story using one of the chariots we made and used a prop I had made for the Exodus story to show Elijah and Elisha crossing the Jordan river (which I always forget is part of this story). I think it is interesting that water parting is such a theme in the Old Testament. I have some colored scarves in the classroom that I used to look like the fire in the story. 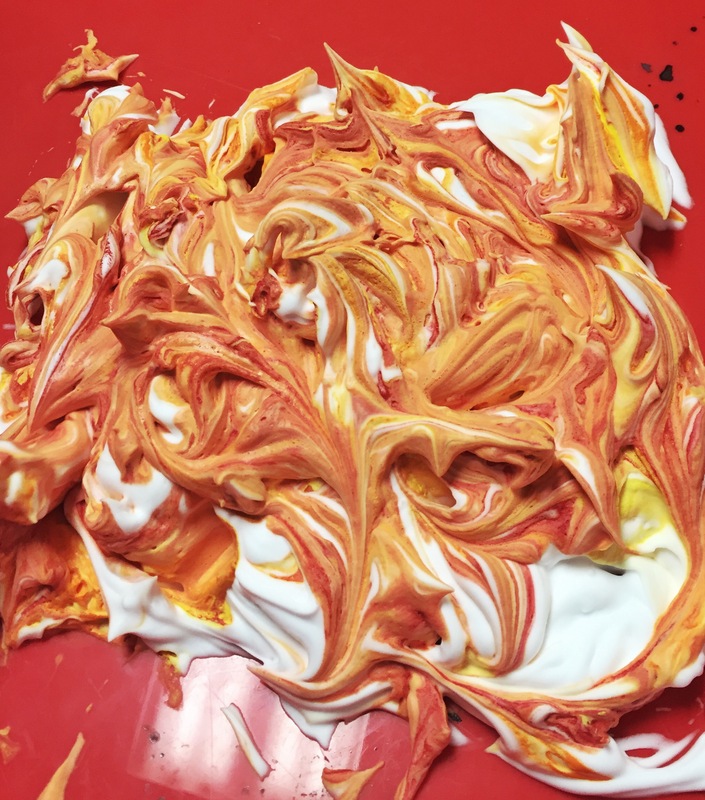 After the lesson, the kids swirled orange, yellow, and red paint into shaving cream to represent the fiery chariot and whirlwind. We used the shaving cream to create marble paintings and then attached a picture of Elijah that I had pre-cut before church. I gave the children a few minutes to swirl the paint and then lightly pressed a piece of paper on top of the swirly shaving cream. Be sure to do this step before the kids have swirled all the paint in or you will just have pictures that look like and orange Creamsicle. I knew the kids would want to keep playing in that super fun shaving cream so we put the chariots we made right in there! Yup! Pretty messy! Some skipped making the picture and went right to playing in the shaving cream. But it seriously looks like fiery clouds! This would be a great activity to try at home with kids or you can try it in a classroom setting like we did. We had 11 preschoolers on this day and two adults. We were busy but it wasn’t overly stressful. We have enough trays in our classroom so that each child has their own area. This helps contain the mess. Sometimes one or two of the kids start to get a little excited and spread off the tray onto the table or themselves, but typically a quick correction and all is well. We also have plenty of work smocks to cover those Sunday clothes. We left a good amount of time for clean up and took a lot of pictures to show to parents. We don’t have a sink in our classroom so a trip to the bathroom was a necessity! 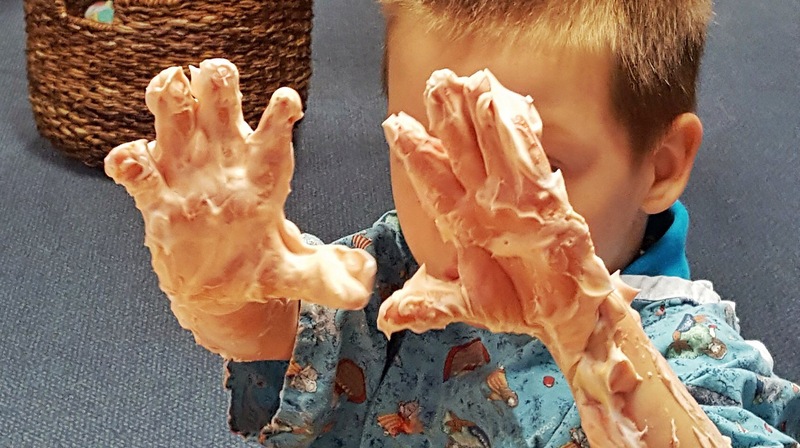 Including messy play in Sunday school is so valuable for children and very memorable since it involves so many senses. The key is to prepare the environment in advance, leave enough time so the kids are able to explore and engage the materials (ideally for about 15 minutes), and to have a plan in place for clean up. 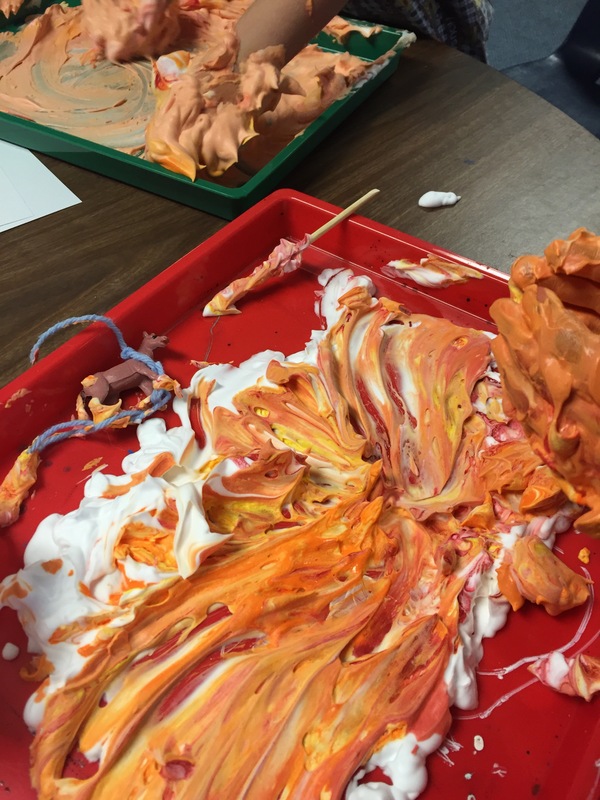 Believe it or not—all the evidence of our messy work was taken care of before parents came to get their kiddos. The kids even cleaned all the tables. 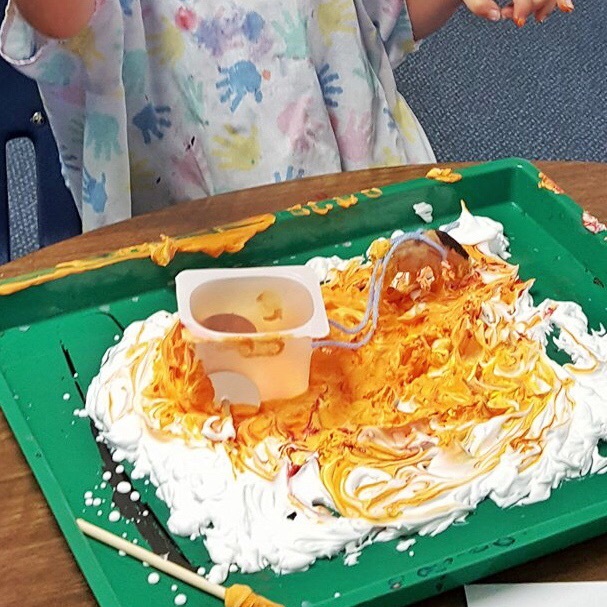 How messy do you get during Sunday school activities? How do you contain messy activities so clean up is stress free?